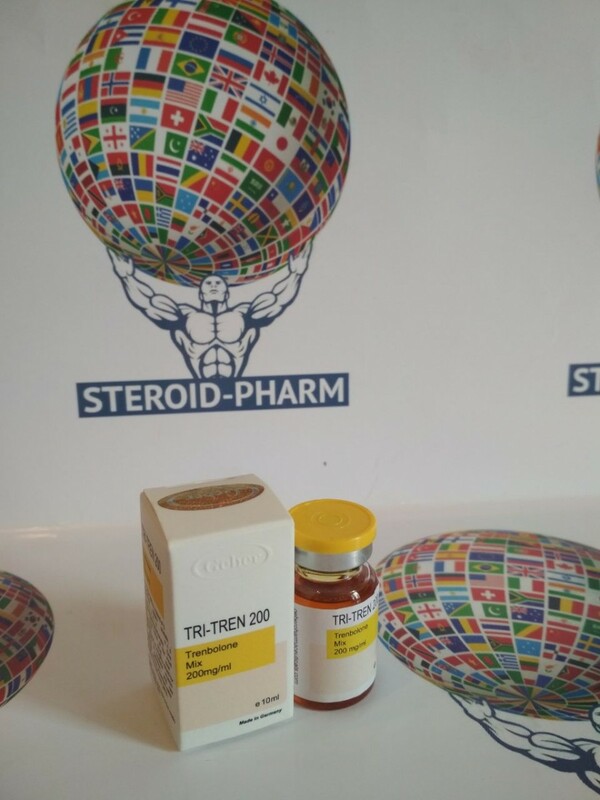 Trenbolone mix 200 is a mix of trenbolone esters. Today this steroid is considered the most powerful. He surpassed even combinations of testosterone preparations. Trenbolone mix consists of ethers of different chains: hexahydrobenzylcarbonate, enanthate and acetate. It has similar properties with sustanon. The main quality of the drug is fast work and prolonged activity. Acetate is absorbed rapidly and increases anabolic effect. Also active is enanthate. Active action occurs 5-7 days after the first injection. This element greatly increases the power tone. After the third ether, hexahydrobenzyl carbonate is activated. The action begins in 10-12 days. During this period, there is an increase in muscle density. Geber Pharmaceuticals produces the drug and monitors the balance of the mixture during the production of TRI-TREN 200. The hormonal background of the drug maintains a balance without a sharp increase and decrease, which does not affect the nervous system and the body as a whole. The active substance is 200 mg per ml. The form of release - bottles of 10 ml. ·Absence of nervousness and aggression. This drug can be used in a small number of injections. It has no adverse reactions. The use of the drug alone will give an excellent effect. It can be use by both beginners and experienced professionals. There are no analogues of the drug in pharmacology. For beginners, individual intake of the drug is good, without the combination of any others. Dosage for each is made individually, depending on the physiological parameters and the desired effect. The recommended dose is 400 mg per week. After taking 2 weeks, an increase of up to 450 mg, if necessary, is possible. Combine with other drugs doesn’t make sense, since the effect will be on maximum. Professionals are recommended a semi-combined course. Up to 600 mg of TRI-TREN 200 one time per week and 1 preparation for background support. The combination with Testosterone enanthate is 150-250 mg per week. This is the minimum dose that will be enough. You can replace the weak steroid in tablets - Oxandrolone. For drying, you can combine with Stanozolol in tablets. You can also use injections. The dosage is minimal. The duration of this scheme is up to 8 weeks. In comparison with the standard application of trenbolone, this option allows longer taking the drugs, since the half-life is much longer due to hexahydrobenzyl carbonate. The minimum duration of the course is about 6 weeks. After the course therapy, Clomid and Kabergoline are administered. In addition to testosterone, anastrozole must be administered. Postcourse therapy (PCT) begins on the 10-14 day after the first injection. The progestational activity of Tamoxifen makes it incompatible with this drug. Duration of PCT is about 2 weeks. In the last 2 weeks of the course, gonadotropin is administered to normalize fertility and testicular function. Also, the phenomenon of recoil will be much less with such a scheme of application of drugs.